Denton City Council’s goal to use 100 percent renewable energy is not the first such initiative in the city. 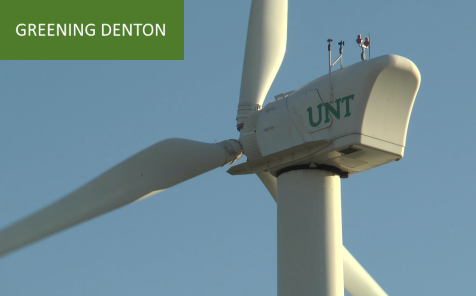 The University of North Texas in Denton was the first university in the state to install wind turbines on its campus and the first in the nation to incorporate renewable technology in an athletic complex and football stadium. UNT says its wind turbines are part of a “comprehensive strategy to become a leader in sustainability and achieve carbon neutrality.” All of the university’s electricity comes from renewable sources. The portion not produced on campus with wind and solar technologies is purchased from offsite producers using wind turbines and solar arrays. “Greening Denton” is a four-part series of text, video and audio reports that presents what they found. This first installment includes an article, interactive map, podcast and video mini-documentary. DENTON – The North Texas city that once made national headlines for trying to ban fracking is still making news with its approach to energy – but this time with much less controversy. The city of 136,000, about 40 miles northwest of downtown Dallas, plans to start using 100 percent renewable energy from solar and wind by 2020. That makes it the second Texas city, after Georgetown, to change to 100 percent renewables. As coal’s role in Texas electricity continues to plunge and wind and solar production grows, renewable energy as an official goal is also likely to gain more converts, especially with cities that, like Georgetown and Denton, operate their own power companies. But in Denton’s case, and in the parlance of Texas energy, 100 percent renewable doesn’t always mean a complete break from fossil fuels – a nuance that both complicates green energy philosophy and acknowledges the realities of how the state’s power grid works. To hedge its energy costs during high-priced times such as summer heat waves, last month Denton began operating a new, 225-megawatt power plant fueled by natural gas – the same fuel that the city’s voters overwhelmingly rejected in a referendum in 2014. Nearly 59 percent of city voters approved an ordinance to prohibit any more hydraulic fracturing, or fracking, within the city. Hundreds of wells drilled by fracking that were already in operation had drawn complaints about noise, truck traffic and air and water pollution. This interactive map by Avery Dufilho provides information about natural gas wells and photos of the well sites and their neighborhoods. Click on the icons on the map or on the arrow icon at the top, next to the headline. Denton is a college town with a well-known progressive vibe, home to the University of North Texas, with just over 38,000 students, and Texas Woman’s University, with just over 15,000. A Texas Tribune analysis found that college student voters didn’t deliver the anti-fracking vote’s victory, but did play a significant role. The ban was a direct challenge to state jurisdiction and was short-lived. In what critics called a betrayal of a supposed Texan belief in local control, the Legislature responded in 2015 by banning such local bans. Denton’s decision to switch to renewables helped restore some of the environmental bona fides lost when the state killed the fracking ban. Some said the plan wasn’t green enough since it includes the new gas plant; the city is also part owner of a coal-fired plant near Bryan that’s for sale and could be mothballed if no buyer emerges. But the renewable energy goal still seemed in keeping with the city’s political leanings. “We are a, I guess, what I like to think of [as] a blue-thinking city in a red state,” said Isabel Rodriguez, a UNT student and 14-year Denton resident. Like Denton, Georgetown is also a college town, with private Southwestern University, but it’s a solidly Republican red one. Georgetown Mayor Dale Ross said the city went to 100 percent renewable energy because it made economic sense. Denton officials planned the move for five years, talking with residents and businesses and eventually hiring the same consultant that guided Georgetown’s decision. Having an energy plan that would sustain economic and population growth was among the concerns that planners heard. Denton Municipal Electric, the city-owned electric utility, now provides 40 percent wind energy to its customers by buying credits from wind generators. The city had aimed to reach 70 percent renewables in 2019. But in June, the Denton Record-Chronicle reported, officials said they expect cheaper prices and expanding renewable energy technology will let the city reach 89 percent renewables next year. Ross said Georgetown blazed the trail on the political side for cities to grab those opportunities. University of North Texas journalism students produced several podcasts, collectively titled “NT Nightly,” as part of this project. (NTDaily is the umbrella name for the university’s official student-produced news media.) In this initial podcast, students introduce themselves and launch a discussion of Denton’s goal to use 100 percent renewable electricity. Participating in the conversation are Matt Berger, Jake Cramer, Bethany LaChance, Julian D. Perry, Alexandria Reeves, Derek Siler. “The first 44 percent” is the first of three mini-documentaries explaining the Denton renewable energy plan. The videos were produced by Julian D. Perry, Brady Keane and Colin Mitchell, and presented by Julian D. Perry. The city of Denton, often regarded as a progressive enclave in a conservative state, plans to become only the second city in Texas to switch to 100 percent renewable electricity. The city-owned electric utility already supplies 44 percent renewables. This video offers an update on the city’s progress and the challenges that it faces in reaching 100 percent by 2020.